Plus Ventless Gas Logs & Fireplaces and More! AF Farabelli provides new gas line installations, expert installation of gas lines to appliances, sales and service of White Mountain Hearth vent-free gas logs and fireplaces, conversion of conventional wood-burning fireplaces to gas, and installation of patio gas grills, fire pits and lighting. And with over 25 years experience, you can count on great results. We serve the greater Harrisburg area and beyond, including Cumberland, Dauphin, Perry, York, and Adams Counties. Need a new gas line installed? We expertly install new gas lines to appliances like ovens and laundry dryers. We also install fuel lines. We offer sales and service of White Mountain Hearth vent-free gas logs and fireplaces. We also convert wood-burning fireplaces to gas! We install patio gas grills, gas fire pits, gas lighting and more to make outdoor living more enjoyable, convenient and efficient. 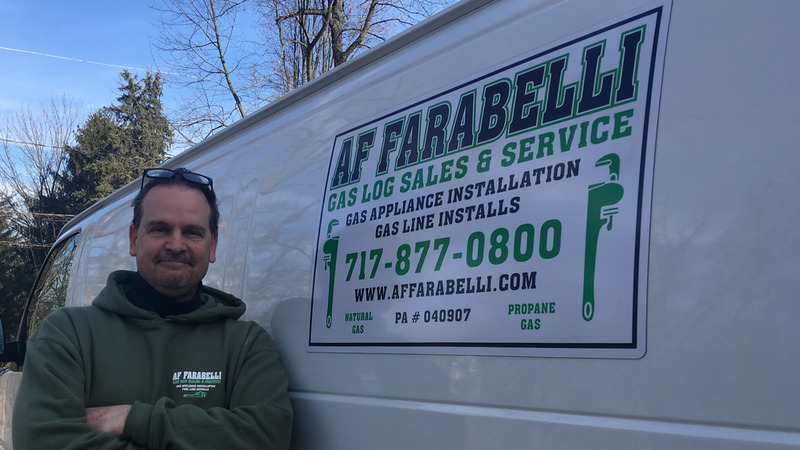 With over 25 years experience, both as a former Harrisburg Natural Gas Company employee and as a licensed contractor, Fred Farabelli delivers prompt, efficient service and expert results.